With a little extra time over the holidays, I wanted to brew up a few batches. I’ve never made anything along the lines of an altbier before, so a recipe in the November 2015 issue of Brew Your Own caught my eye. It’s a clone recipe from the Milwaukee Brewing Co., called Louie’s Demise. From what I know of the style, the recipe hits most of the notes for an altbier, but takes an American bend in the malts (unspecified 2-row malt, which I presume is usually brewed with an American variety rather than Pils malt) and the yeast (WLP051, California V, rather than a German ale yeast). I made a few additional tiny modifications for my ingredients on-hand, and thus beer is titled the “Alt-Alt Ale”. It has a ring to it, and also vaguely reminds me of the AT-AT’s from Star Wars. One interesting thing about this recipe is the use of honey malt. My eye has been on this for some time, but I’ve never actually brewed with it. This malt has a very strong aroma, with a thick, sweet and raisin-like character. It’s almost reminiscent of crystal 80, but much stronger. I think it’s going to be quite good, but I also think it would be something to use with caution in other recipes. This is a malt that’s nice to use when you need it, but could overwhelm a brew if competing with more delicate ingredients or aromas. From the yeast harvested at last batch, I prepared a 1L starter to aim for ~200 billion yeast cells (I “needed” 188 billion). I had only intended for it to sit overnight, but due to illness and then Christmas it ended up cold-crashing for another six days in the refrigerator. Because the starter should (theoretically) have been at full-strength, I didn’t figure that this was too big of a problem. One interesting thing I noticed is that the yeast this go-around seemed to be a bit more flocculent than I am used to for WLP001, with behavior closer to that which I normally see for WLP002. This recipe called for a somewhat thinner mash than I usually do, at 1.4 quarts of water per pound of grain. I mashed in with 4.78 gallons of water at 159.1°, which hit a mash temperature of 148.1°. This was effectively dead-on for my target (148°). The mash temperature was down to 145.5° after 30 minutes, and down to 144.5° after 45 minutes. After a 60 minute mash, I added 0.25 gallons of water at 210°, to raise the mash temperature to 145°. I let it sit for 10 minutes, vorlaufed, and collected the first runnings. Then I added 3.78 gallons of water at 180°, which raised the mash bed to 160°. I let it sit 10 minutes, vorlaufed, and collected the remainder of the wort. Altogether, I collected 6.8 gallons of wort with a gravity of 1.045, for 74% mash efficiency. I boiled the wort for a total of 60 minutes, adding the hops and Irish moss at the intervals indicated above. After the boil, I chilled the wort down to 76°, transferred to the primary fermenter, and pitched the yeast. I had approximately 6 gallons of beer in the primary, with a starting gravity of 1.052. I brewed the beer on 26 December 2015, and plan to ferment it at 67° for around two weeks. This entry was posted in altbier and tagged AAA, Alt-Alt Ale. Bookmark the permalink. 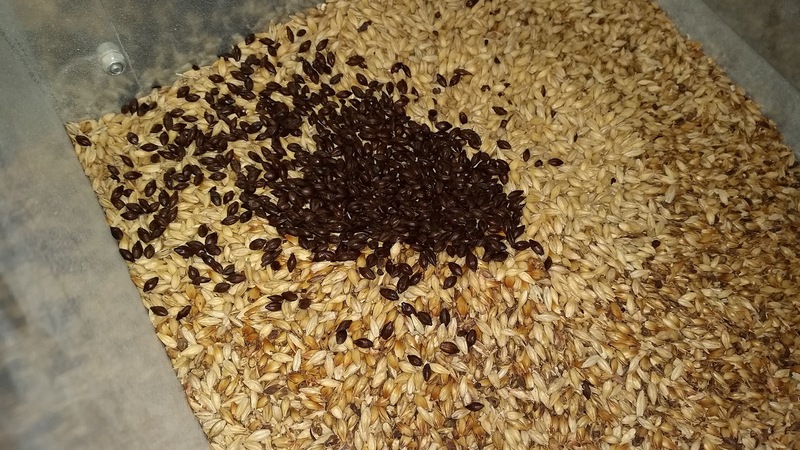 I have used honey malt in the past for a dopplebock and a mai(helles) bock. I really liked what it brought to the beers. Cool! Maybe one of those will have to be next (I've got leftover malt). I haven't done any bocks yet, so I've some brewing horizons to broaden.